The Apollo 13 Lunar Module Systems Activation Checklist (Credits: NASA). Several months after NASA challenged ownership of Apollo astronaut mementos being sold at auction, the US legislature has weighed in on the side of the astronauts. On September 19, the House of Representatives unanimously passed a bill assigning ownership of such artifacts to the Apollo-era astronauts who flew with them. The controversy began in the past decade, when NASA first began challenging what had been a common practice through the Mercury, Gemini, and Apollo programs. Although astronauts were not requested to return artifacts kept as personal remembrances, the agency did challenge high profile sale of such items. The most recent incident occurred on November 30 when an auction including a checklist booklet used to guide Apollo 13 back to Earth sold for the highest price of any Apollo artifact that has not been on the Moon. 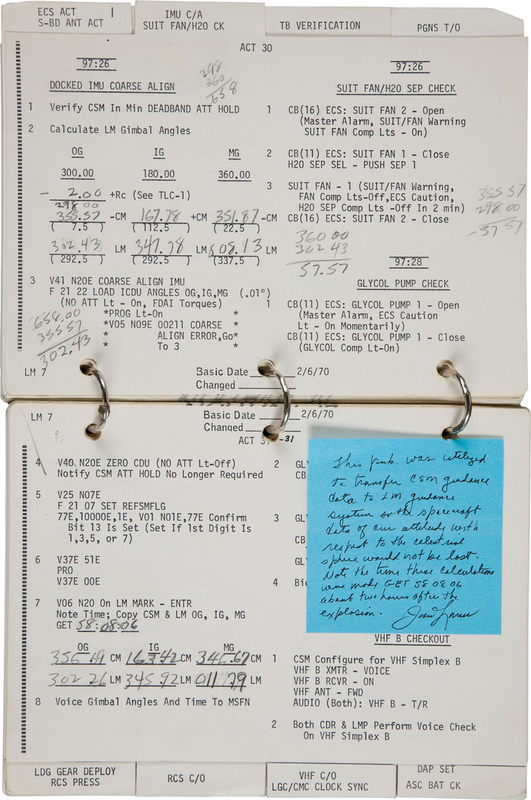 Apollo 13 commander Jim Lovell had found the checklist, including his handwritten calculations that brought he and his crew back to Earth after a crippling accident, collecting dust on his bookshelf. Firmly believing the book to be his property, Lovell put it up for auction. NASA halted transfer of the $388,375 checklist, a $13,145 lunar module identification plate, and a $22,705 Apollo 9 command module rotational hand controller in January, claiming ownership of the items. House approval does not make the bill law. The US Senate must also vote on the bill, after which it could be signed into law by the President. The bill specifically excludes ownership of any lunar samples from passing out of NASA’s ownership. NASA has already lost hundreds of lunar samples that were loaned out for research and never returned.